The AJC Peachtree Road Race, organized by Atlanta Track Club, is the largest 10K in the world. 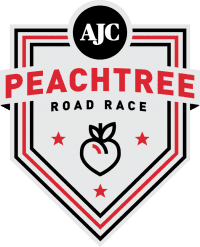 In its 47th running, the AJC Peachtree Road Race has become a Fourth of July tradition for thousands of people throughout the metro Atlanta area and beyond. Come kick off your Fourth of July festivities with us! Congratulations finishers! 2015 results are now available here. MarathonFoto was on the course and at the finish of the race to capture your photos. Post-race, view the photos captured by MarathonFoto here.